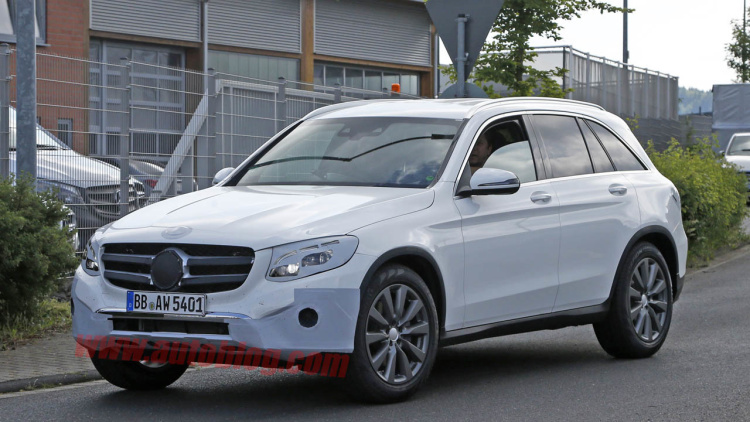 Mercedes is set to officially take the wraps off its new GLC-Class crossover tomorrow, but if you can’t wait that long, here it is all but completely undisguised. The GLC, for those just joining us, is the replacement for the GLK, rounder and renamed to align more closely with the C-Class. It was previewed as a slant-roofed concept in Shanghai, but as you can see, it’ll reach production with a more conventional greenhouse. Rooflines (and various show-car details) aside, the production GLC looks pretty close to the aforementioned Concept GLC Coupe. Certain elements on this pre-production unit still remain taped up to keep from our prying eyes – though the engineer driving it doesn’t seem to mind. We can at least hope that rather ungainly looking chrome lower rear bumper element is just there to throw us off, or will look more convincing as part of a complete package. But we’ll be finding out one way or another tomorrow… so watch this space.